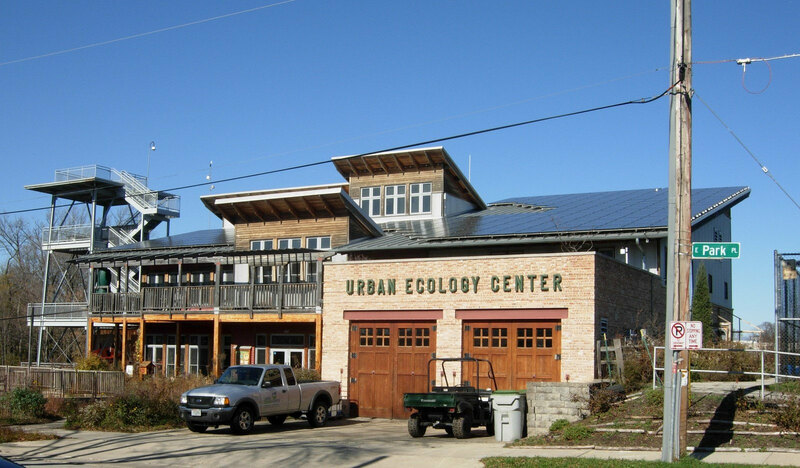 The Urban Ecology Center (UEC) is a nonprofit organization that promotes environmental awareness in Milwaukee. In 1991 residents of the area around Riverside Park began organizing park cleanups as a way to teach children about the environment, as well as to fight pollution and crime. They soon organized as the UEC and began hosting classes out of a trailer located near the park. The long term viability of the center was initially precarious, as the MILWAUKEE PUBLIC SCHOOLS (MPS) owned the land where the trailer sat, while MILWAUKEE COUNTY owned most of the park. UEC officials worked through these issues in the 1990s. UEC and MPS worked out a land swap. UEC got the land where the trailer sat to build a permanent facility, in return for continued educational activities in the new building. The County and UEC signed a preservation lease for $1.00 a year; in return the UEC took responsibility for managing the County-owned portion of Riverside Park. 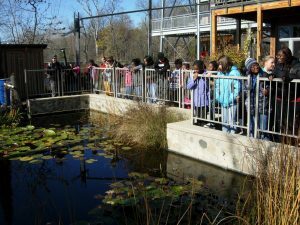 One of the UEC’s most recognized programs is the Neighborhood Environmental Education Project, which reinforces science learning with outdoor, hands-on activities for schoolchildren. The organization also runs programs for schools and the general public, including lending outdoor equipment, offering information on sustainable food, and hosting summer camps. In 2004, the UEC opened a community and education center constructed of recycled and renewable materials. While the headquarters remained in Riverside Park, UEC opened two other branches. The Washington Park branch opened in 2007, and the Menomonee Valley branch opened in 2012. In 2013, the three locations hosted 300,000 visitors, including more than 25,000 students. ^ “Mission Statement,” Urban Ecology Center, accessed January 8, 2015. ^ “History,” Urban Ecology Center, accessed January 8, 2015. ^ Peggy Schulz, “Rise of the Urban Ecology Center,” Urban Milwaukee, January 9, 2013, accessed January 23, 2015. ^ “NEEP,” Urban Ecology Center, accessed January 23, 2014. ^ “What We Do,” Urban Ecology Center, accessed January 23, 2015. ^ Meg Jones, “Urban Ecology Center Restroom Is Nature’s Calling,” Milwaukee Journal Sentinel, December 13, 2008, http://www.jsonline.com/entertainment/36114994.html, accessed January 8, 2015. 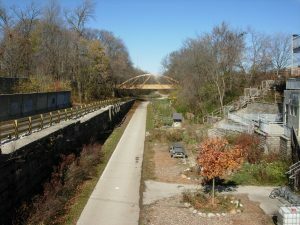 ^ “Washington Park Overview,” Urban Ecology Center, accessed January 8, 2015; “Menomonee Valley,” Urban Ecology Center, accessed January 8, 2015. ^ Thomas Content, “Green Building Alliance Awards Honor Wisconsin Sustainable Projects,” Milwaukee Journal Sentinel, November 13, 2014, accessed January 23, 2015. Schulz, Peggy. “Rise of the Urban Ecology Center.” Urban Milwaukee, January 9, 2013, accessed January 23, 2015.